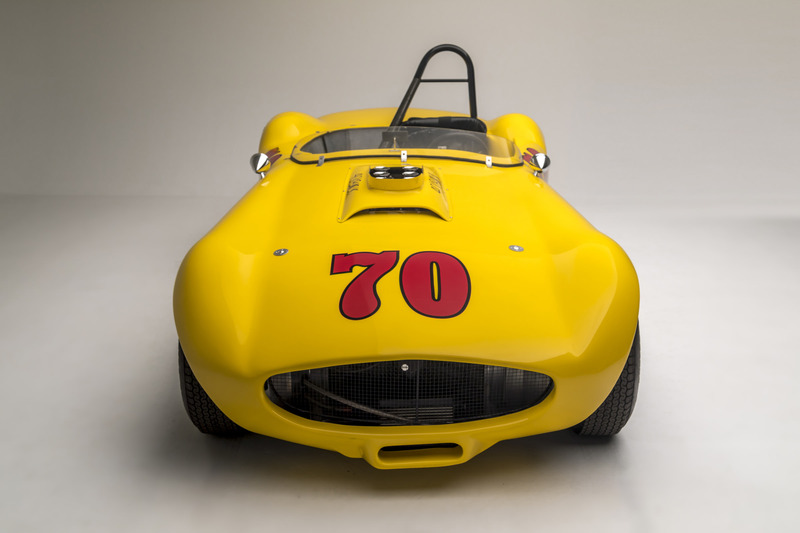 Ol’ Yaller Mark IX is a race car built by Max Balchowsky and his wife Ina largely from junkyard parts to a design he sketched in chalk out on the floor of Hollywood Motors – their Californian performance garage. 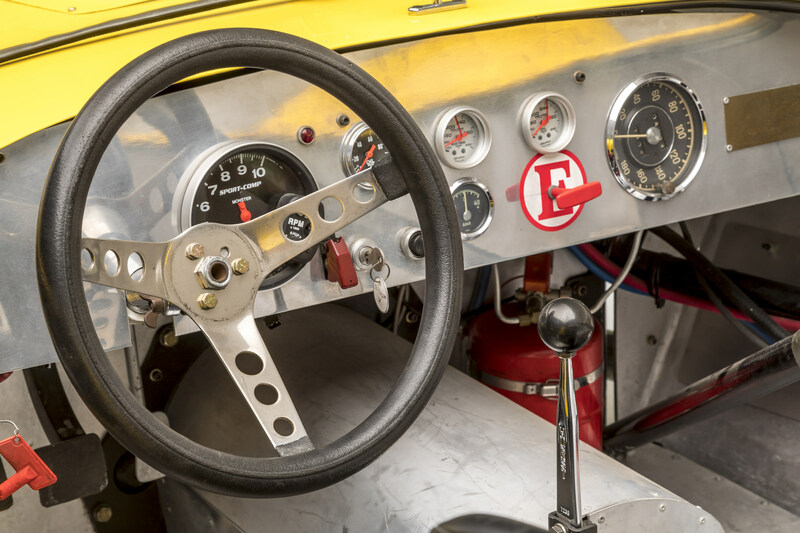 Although he’s famous in motoring circles for his astonishingly successful self-designed and built race cars, it’s likely that the most famous car that Max ever turned a wrench on was Steve McQueen’s 1968 Ford Mustang used in the film Bullitt of the same year. 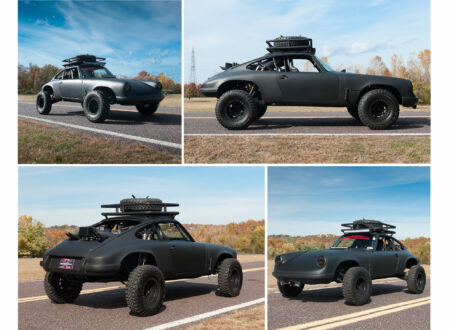 Max modified the car with an engine rebuilt for performance, heavy-duty suspension to handle the jumps it would be doing across San Francisco, and a new set of upgraded brakes to bring it all screeching to a halt when needed. 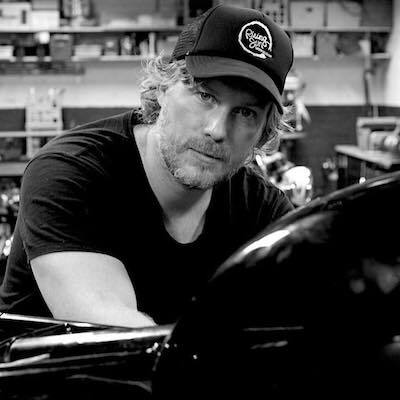 The two Bullitt Mustang’s built for the film are now amongst the best-known cinema cars in history, but in fascinating the story of Max and Ina Balchowsky their brushes with Hollywood were merely minor highlights, and a distraction from their true passion – racing their own creations against the best in the world. 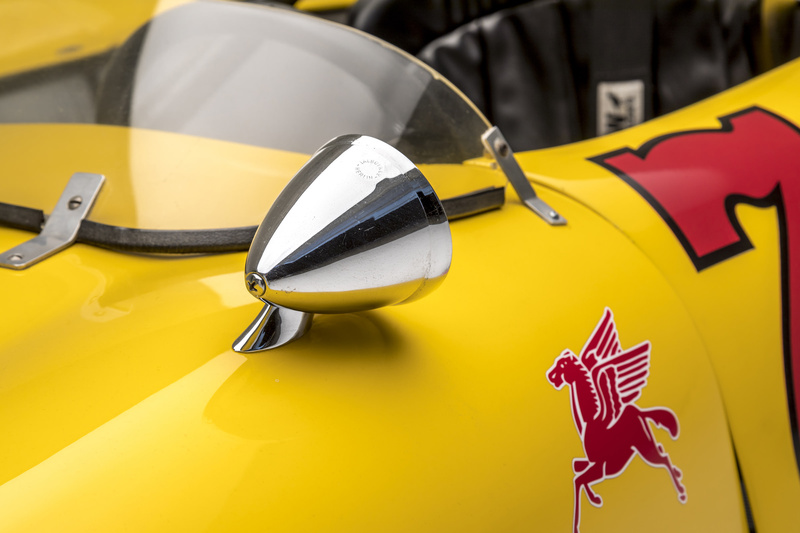 Above Image: Max and Ina Balchowsky work on Old Yeller IV, in the paddock at Riverside. 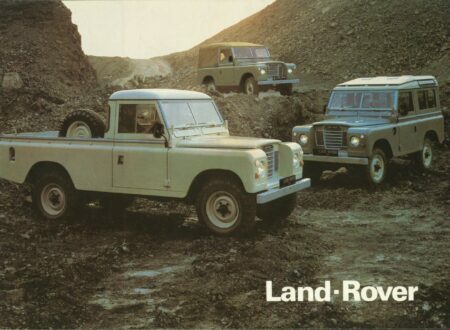 “We can replace anything with anything”. 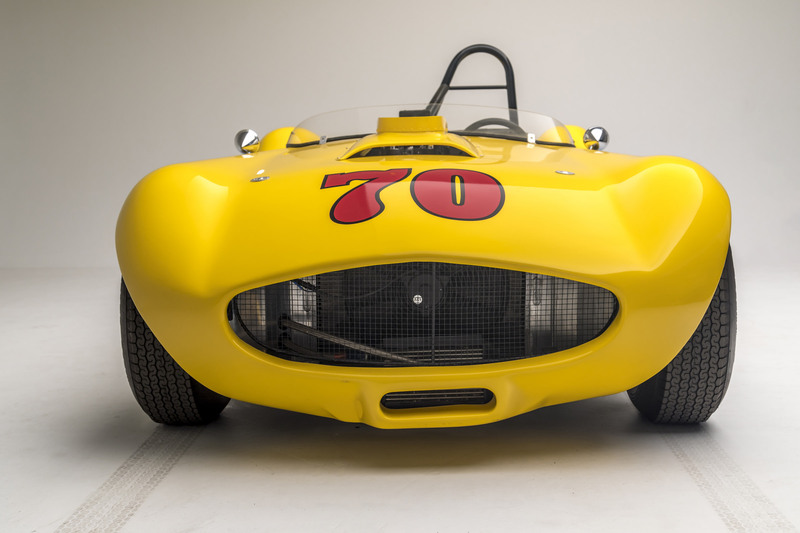 In the early 1950s Max drove a borrowed Jaguar XK120 in a number of races, but he realized he could build a quicker car himself – so he did. In 1957 Max and Ina began the process of marking out a basic steel-frame chassis on the floor of their garage, marking in where the engine, gearbox, and differential would go. 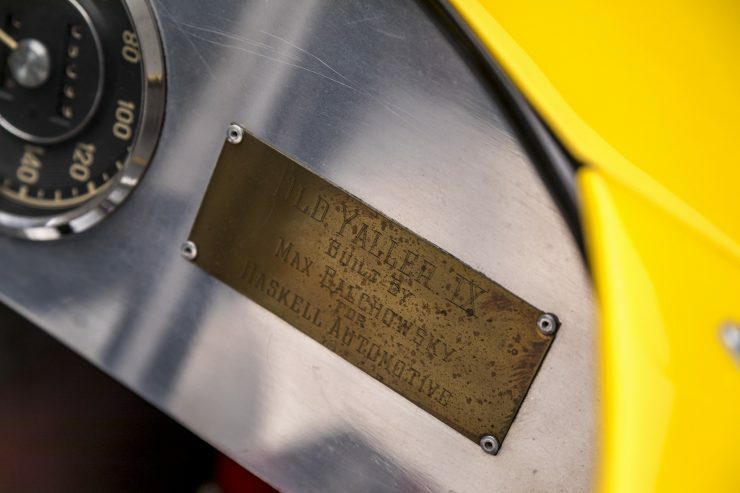 As the frame was welded up and the car neared completion the couple saw the film “Old Yeller”, a film about a stray mixed-breed dog that would become a loved member of the family, and eventually fight off a bear, wild pigs, and a rabid wolf to protect them. 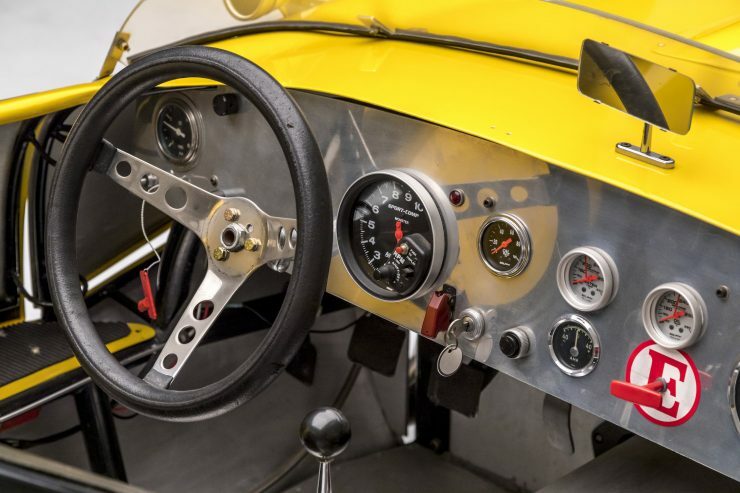 The name Old Yeller appealed to the couple of as they knew their own car was going to be a mongrel too, as well as a loved member of the family capable of fighting off all manner of snarling beasts on the race track. 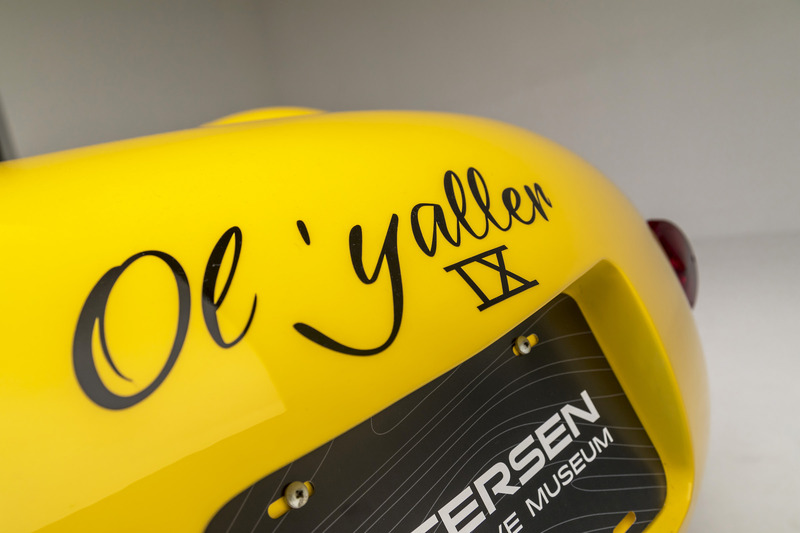 Their first car was named Ol’ Yaller Mark I, it would be followed by eight more designs, each named in their order of appearance from Mark I to Mark IX. Over the course of the late 1950s and well into the 1960s the Balchowsky cars would enter many of the most important races in the USA, often piloted by Max himself. Other drivers would get a chance to try their hand in an Ol’ Yaller too, icons like Carroll Shelby, Dan Gurney, Bob Bondurant, Billy Krause, Bobby Drake, and Paul O’Shea. 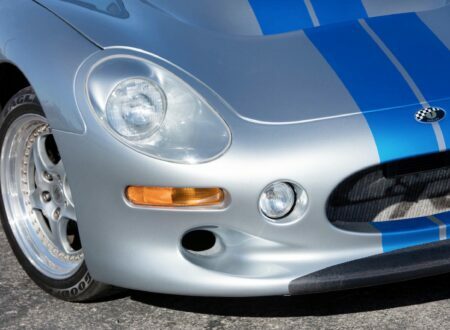 The cars would compete against the best in the world including Ferraris, Maseratis, Aston Martins, Jaguars, Corvettes, and countless others. 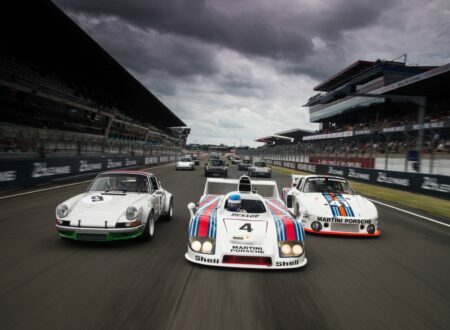 Each were bested by various iterations of Ol’ Yaller over the years and the cars took wins, podiums, and points positions against many of the best-funded racing teams in the world. 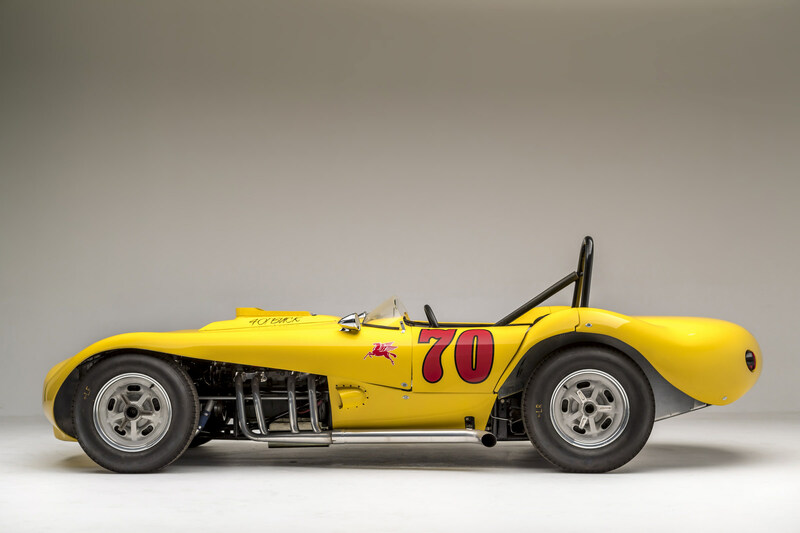 The car you see here is Ol’ Yaller Mark IX, this would be the final design from the minds of Max and Ina Balchowsky, incorporating many of the lessons they learned over the years, resulting in one of their quickest cars ever. 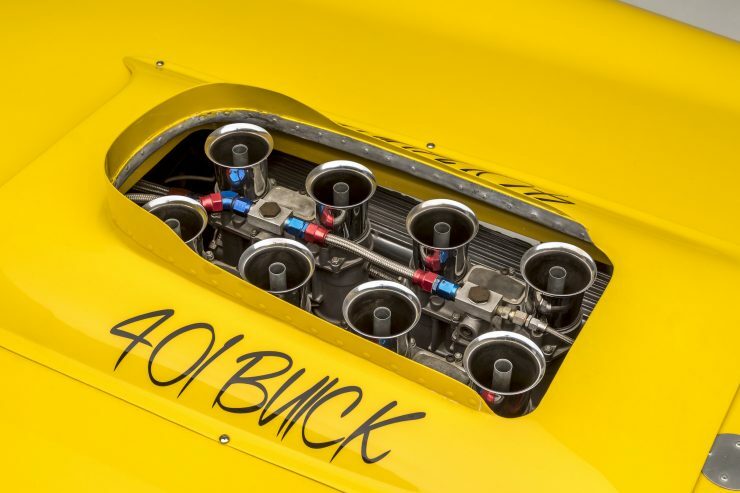 As with all examples of the Ol’ Yaller series the car has a tubular steel space frame chassis with a front-mid-mounted American V8 – a 401 cubic inch Buick in this case. 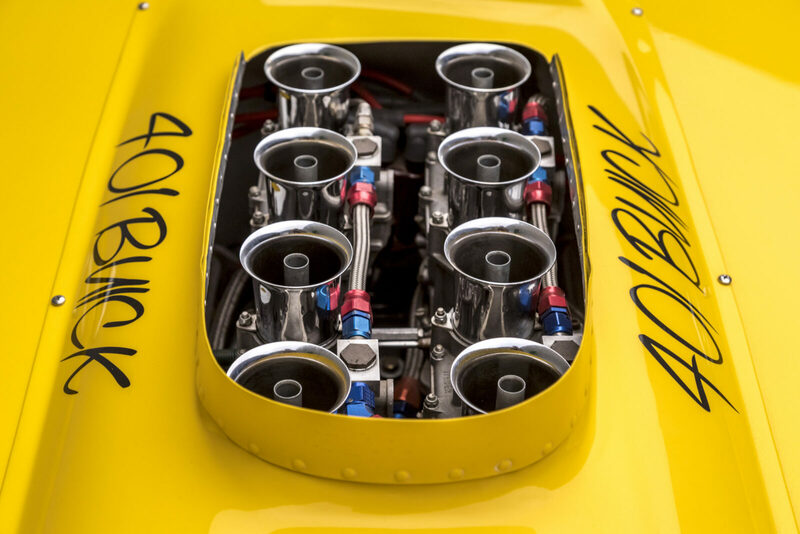 Unlike their well-funded European competitors Max and Ina built cars strictly to go fast, not to look pretty, although they often succeeded in building attractive cars almost by accident. 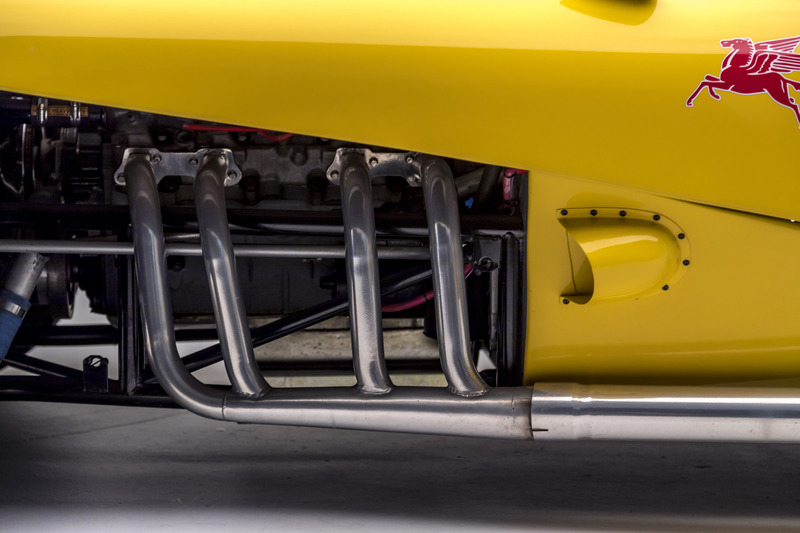 Whereas the European cars often had perfect panel gaps and were polished to within an inch of their lives, the Ol’ Yallers were a little less refined, with chicken wire front grilles, varying width panels gaps, and styling that had been drafted in chalk on a concrete floor rather than on a drafting table in Maranello. Ol’ Yaller Mark IX was built in 1963, it’s powered by a 310 bhp Buick “Nailhead” V8 capable of sending the car from 0 to 60 mph in under 4 seconds due to the cars feather-like kerb weight. 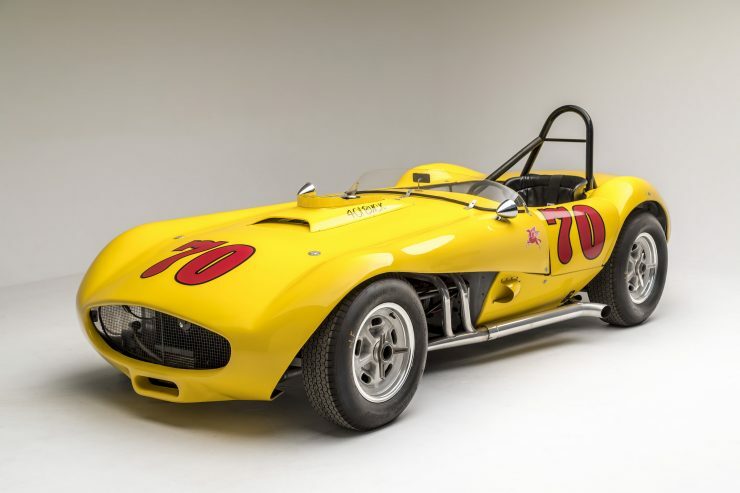 Interestingly the car was driven Elvis Presley (towed on a trailer, but made to look like it was driving) in the film Viva Las Vegas and it made an appearance in the Herbie film The Love Bug in 1968. The car was restored in more recent years back to its original condition from 1963 under the ownership of Peter and Lynda Shea, it was then raced extensively in historic motorsport competition – including at the Monterey Historics. Peter and Lynda donated the car to the Petersen Automotive Museum after years of successful vintage racing, and the car is now a treasured member of the Petersen Museum’s permanent collection. 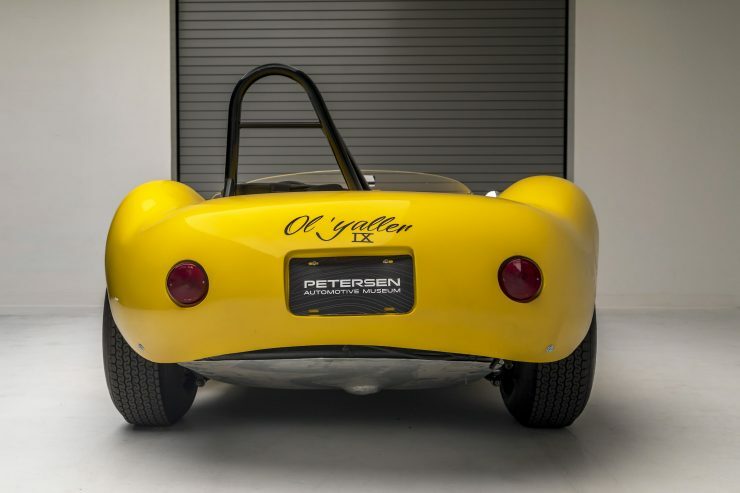 If you’d like to see Ol’ Yaller Mark IX the Petersen will be showcasing the car as part of the exhibit “Legends of Los Angeles: Southern California Race Cars and Their Builders”. 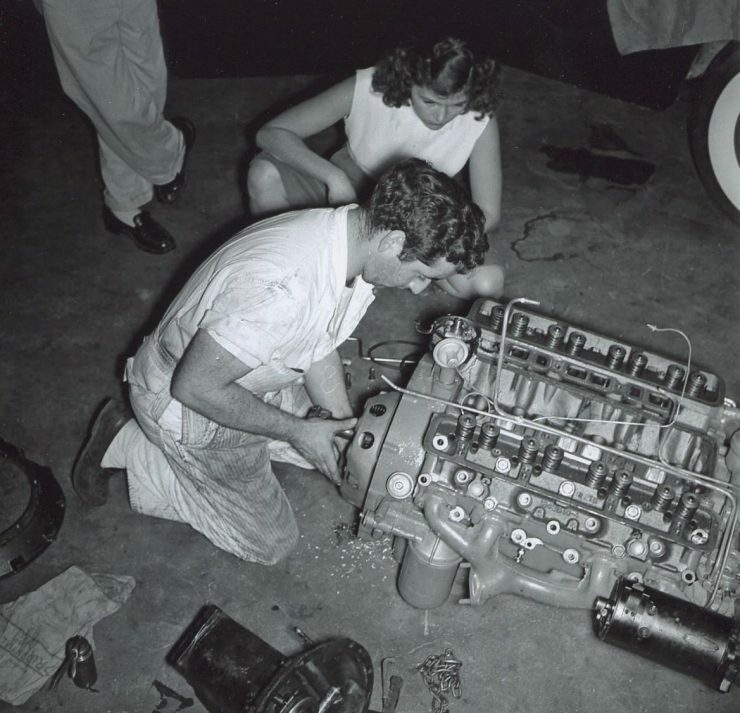 Above Image: Max and Ina Balchowsky working on an engine on the garage floor.